길거리에서 덴마크인을 멈춰 세워보려 한 적 있나? 아니면 많은 덴마크인과 같은 집단에 속했던 적은? 어땠나? 덴마크인이 냉정하고 폐쇄적인 사람처럼 보였나? 이 기사에서 나는 덴마크인이 친해지기 어렵고 냉정한 사람으로 보이는 이유를 설명하겠다. 그 작은 비밀은 우리가 갖고 자라는 일종의 사고 방식이다. 1933년 악셀 산데모제(Aksel Sandemose)는 소설책 한 권을 썼다. <도망자, 지난 발자취를 되밟다(En flyktning krysser sitt spor∙A fugitive crosses his tracks)>라는 소설 속에 얀테의 법칙(Jantelov∙Jante Law)이 처음 등장한다. 얀테의 법칙은 대다수 스칸디아비아 사람이 일상 속에서 따르는 10가지 법칙이다. 몇몇 사람은 얀테의 법칙이 모세의 10계명을 기반으로 삼는다고 말하기도 한다. 당신이 얀테의 법칙을 이해하고 나면 그것이 전혀 유쾌하지 않다는 사실을 깨닫게 될 거다. 몇몇 사람은 우리가 거의 모든 면에서 무척 모순적이기 때문에 그렇다고 말한다. 다른 이들은 우리가 부를 자랑할 때 매우 조심스러울 수 있기 때문이라고도 한다. 나는 책이 나오고 58년 뒤에나 태어났으니 그때 사람들이 무슨 생각을 했는지 알 도리가 없다. 하지만 우리가 사는 지금 이 순간에도 안테의 법칙이 맞아떨어진다고 나는 얘기하겠다. 안테의 법칙을 읽을 때는 이 점을 유의하라. 안테의 법칙은 다른 사람을 향한 당신의 시각에서 쓰였다. 안테의 법칙은 계속 우리(us)라는 단어를 쓴다. 여기서 우리란 당신의 친구나 가족 같이 연결돼 있다고 여기는 사람의 집단을 뜻한다. 얀테의 법칙 10계명은 이렇다. 네가 우리와 같다고 여기지 말라. 네가 우리보다 똑똑하다고 여기지 말라. 네가 우리보다 우월하다고 여기지 말라. 네가 우리보다 많이 안다고 생각하지 말라. 네가 우리보다 중요하다고 생각하지 말라. 네가 무슨 일이든 다 할 수 있다고 여기지 말라. 모두가 너를 신경 쓴다고 여기지 말라. 네가 우리를 가르칠 수 있다고 생각하지 말라. 물론 덴마크인 안테의 법칙을 100% 따르며 살지는 않는다. 당신이 얀테의 법칙을 해석하는 방식에 따라 의미가 달라지기도 한다. 얀테의 법의 핵심은 우리가 서로를 동등한 존재로 본다는 점이다. 그렇다고 우리가 모든 인간이 절대적으로 평등하다고 여기지는 않는다. 나이는 중요하다. 덴마크인도 어릴 때는 어른에게 배워야 한다. 우리 가족처럼 말이지. 선생님한테도 가르침을 받아야 한다. 얀테의 법칙은10대를 맞이한 덴마크인한테서 발현된다. 몇몇 사람은 평생 얀테의 십계명 속에서 살기도 한다. 슬로바키아에서 온 친한 친구랑 얀테의 법칙이 어떻게 덴마크인을 냉철한 사람으로 보이게끔 만드는지 논의한 적 있다. 그는 이해하기 무척 어려워했다. 당신한테 그에게 내가 설명했던 같은 예시를 들어보겠다. 덴마크인은 다양한 것을 새로 배우고 싶을 때 스스로 조사한다. 다른 사람이 우리를 가르치길 원치 않는다. (10대가 되고 나서 얘기다.) 덴마크인은 세상의 이치를 스스로 터득하길 원한다. 다른 이에게 묻거나 배우면 진실의 절반만 깨우치는 기분이 든다. 직접 뛰어들어 스스로 연구하고 경험하는 것만이 총체적 진실을 배우는 유일한 방식이다. 그래서 이게 냉혈한 덴마크인과 어떤 관계냐고? 만일 특정 주제나 나라를 우리보다 잘 아는 사람을 만났는데, 그의 의견이 자기 연구결과에 어긋난다면 덴마크인은 퍽 냉소적인 태도로 토론을 시작할 거다. 물론 덴마크인만 그러는 건 아니다. 반대 의견에 적대적인 태도를 보이는 일은 꽤나 흔한 일이니까. 하지만 덴마크인은 여기에 독특한 방법을 동원한다. 한번은 사촌의 여자친구와 한국에서 생활이 어떤지 얘기한 적 있다. 내가 아는 것은 내 경험과 한국 친구들이 내게 말해준 것에 뿌리를 둔다. 그는 신문에서 읽고 학교에서 배운 대로 한국을 이해했다. 재밌는 부분은 여기다. 대화 끝에 패배를 선언하는 쪽은 언제나 나였다. 그냥 대화에 질려버렸기 때문이다. 왜냐고? 그가 자신이 옳다고 고집했거든. 물론 예외 없는 법은 없다. 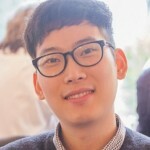 모든 덴마크인이 냉혈한은 아니다. 얀테의 법칙이 무슨 뜻인지 모르는 덴마크인도 있다. 개인적으로 나 역시 얀테의 법칙이 무엇을 얘기하는 건지 스스로 공부하고 나서야 깨우쳤다. 이제 나는 안다. 덴마크인은 새로운 사람들을 마음에 드는지 아닌지 결정하기 전에 그들 앞에 얀테의 법칙을 내보인다. 만일 그들이 마음에 든다면 얀테의 법칙은 사라진다. 100% 좋지 않다면 조금은 잔존한다. 만일 그들이 마음에 들지 않으면, 덴마크인은 스스로를 지키는데 얀테의 법칙을 내세운다. 시간이 지나면서 덴마크인의 시각도 변한다. 덴마크인이 세계에서 가장 행복한 사람으로 꼽힌 뒤로 우리는 스스로를 좀 더 긍정적으로 보기 시작했다. 그래서 어떤 이는 반(anti)안테의 법칙을 만들기까지 했다. 네 마음이 원하는 대로 선택하라. 선두에 서야 한대도 그 길을 걸어갈 용기를 가져라. 처음에 실패할지언정 용기를 잃지 말라. 반대편을 만났을 때는 가능성을 봐라. 두 가지 법칙을 섞으면 덴마크인의 기본적인 가치관을 가진 셈이다. 명심하라. 누구는 얀테의 10계명을, 누구는 반얀테의 10계명을 더 많이 품고 산다. 덴마크인이 차가워보인다고 너무 나무라지 말길 바란다. 당신이 마음에 드는지 아닌지 판단하는 중이라 그렇다. 덴마크인한테 시간을 좀 줘라. 그리고 용감히 자기 스스로를 보여줘라. 한 사람이 당신을 싫어한다면 다른 사람을 사귀면 될 일이다. Have you ever tried stopping a Dane on the street or been in a group with a lot of Danes? Did they come off as cold and closed people? Well in this article I will let you in on a little secret about what kind of mindset a lot of us grew up with that made us seem distance and cold. In 1933 Aksel Sandemose wrote a novel (A refugee cross its tracks) which is the first time our Jantelov has been written down. 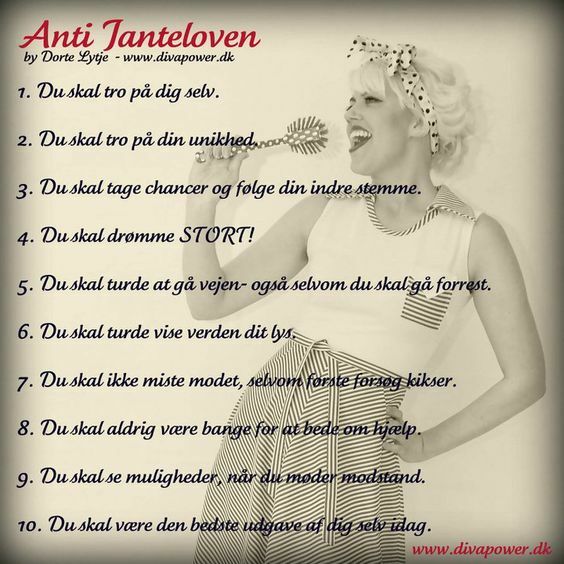 Janteloven is 10 laws that most Scandinavian people follow in their everyday life. Some people would say that its build over the 10 laws of Moses. Once you understand them you will see that they are not very cheerful at all. Some people will say that it’s because we are very ironic in pretty much every way. Others will say that it’s because we can be very cautious when it comes to showing off our fortunes. I wasn’t born until 58 years later so I don’t know what they were thinking. However, I will say that it does fit the time we are in now. When you read Janteloven it’s important that you understand that it’s written from your point of view on other people. Janteloven keeps using the word us which can mean a group of people like your friends or family that you feel you connect with. Of course, we don’t live according to this 100 % and yet again it also depends on how you interpret it. The whole point of Janteloven is actually to show that we see each other as our equals. This doesn’t mean that we are not on different levels because the age does matter. When we are young we have to learn from the elders like our family and teachers but once we reach the teenage years you will see that Janteloven is coming up for us (and for some people it never leaves). I was discussing how this make us seem cold with one of my close friends from Slovakia. She had a hard time understanding how this makes us cold as people. I will give you the same example as I gave her. When we want to learn something new about different things we like to do our own research. We don’t want other people to teach us(this is after we have become teenagers). We want to make our own interpret of things. By asking other people or having other people teaching us feels like we only get half of the truth. So by going and making our own research and getting our own experience is the only way for us to get the whole truth. So how is that making us seem cold? well if we meet someone that knows more about a subject or country we can be very skeptical and start discussions if it goes against our own research. Now I know that it’s very common for people to do that but what makes it different is the way the Danes does it. I have more than once had discussions with my cousin’s girlfriend about how it is to live in Korea. My knowledge is based on my own experience and what my Korean friends have told me. For her, it’s based on what she has read in newspapers and learned in the school. Now the funny part here is that I always end up as the one that is giving up simply because I get tired of the discussion. Why? Because she is insisting that she is right. Of course, there’s no law without any expectations. Not all Danes are cold or even know what Janteloven even stands for. For me personally, I had no idea what was about until I did some more research. 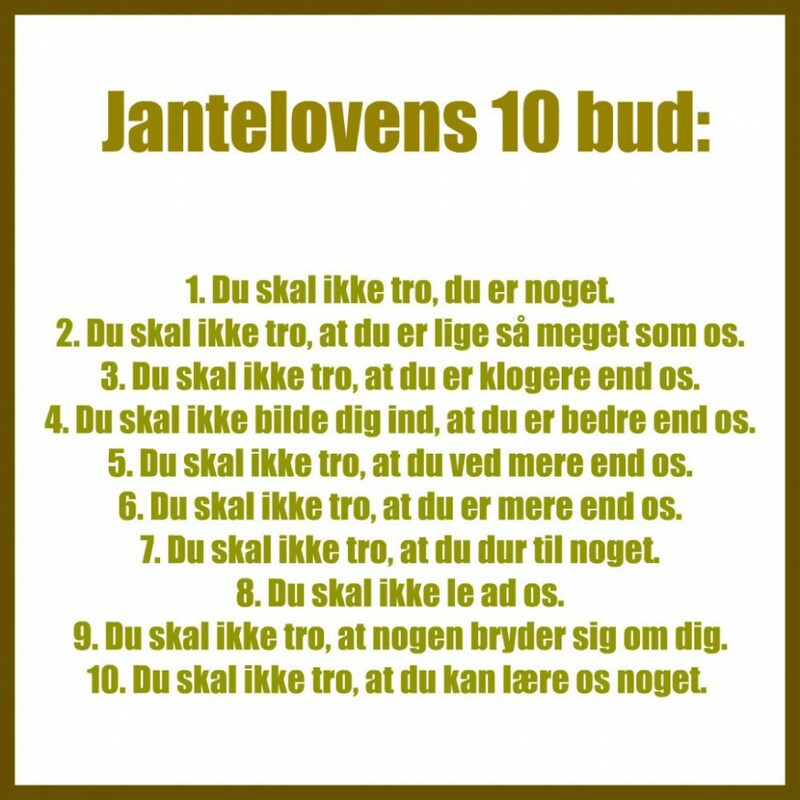 I can see how we use Janteloven in front of new people until we have decided on whether or not we like people. If we like them it disappears if not fully then at least a bit. If we don’t like you we will use Janteloven to defend our self. As times are changing so are our point of view. And since we are some of the happiest people in the world we want a better point of view on our self. So some people actually made an anti-jantelov. So if you mix these two laws you have the Danish ground values. Remember some has more jantelov and some have more anti-jantelov. If Danes seem cold it can because they are trying to figure out whether they like you or not. Give them some time and don’t be afraid to be yourself. If a person doesn’t like you then there will be others that do. 한국 사회는 미국의 영향을 받아서 그런지, 점점 개인의 특별함, 탁월함을 갈구하고 칭송하는 방향으로 가고 있는거 같은데, 저 개인적으로는 덴마크의 이런 문화가 더 마음에 드네요. 개인의 탁월함과 특별함을 강조하는게, 그런 능력을 개발하지 못하면 인생의 패배자가 되는거 같은 실패감을 느끼게 만들고, 지금 한국처럼 행복지수가 떨어지게 만드는게 아닐까 하는 생각이 드네요.